First let me give a shout out to the staff at Cooper Hospital in downtown Camden for taking care of my mom. You guys and gals rock. Mom, we'll see you at home very soon. Now... As I was re-watching the Top Gear Patagonia Special and it occurred to me that we have passed the one year mark of Jeremy Clarkson being fired from Top Gear, and subsequently seeing the resigning of James May and Richard Hammond as presenters of the world's most watched motoring show. And I still honestly think it was the wrong decision... sure he punched someone in a moment of rage, but that has happened to the best of us at one time or another. 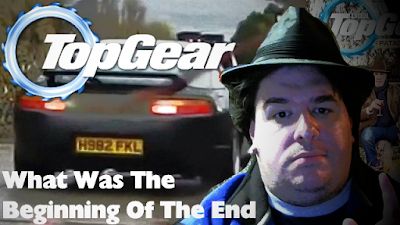 But I can't help but look back at the Patagonia Special as being the beginning of the end for Top Gear as we has come to know it... thanks in part to people seeing malice in something that was pure coincidence. Just seems like a random set of letters and numbers right? Well... some folks didn't think so... cause you see... in 1982... there was the Falklands War between the UK and Argentina...and the locals caused a row, claiming the license plate wasn't real and it was an insult to them. But here's the thing... that license plate was real, it was registered to that particular Porshe on May 30, 1991. It was a pure coincidence, and since it was a British license plate. The car was shipped from the UK to Argentina with the plate it had for nearly 14 years. No one made an issue of it... until a guy Carlos Cristofalo of Autoblog Argentina, caused the controversy just by seeing whats was on the plate taking a picture of it and asking if anyone noticed the reference to the 1982 war, but he proved himself to be a terrible journalist by not doing the research to see if the plate was legit. Which is doesn't make Carlos a journalist, instead makes him a tabloid hack. And what is funny is, that when was presented with the truth that plate for the car was legit... he said it wasn't, saying "No one who has seen every series of Top Gear can think that it was a casual thing" while claiming that Top Gear "doesn't respect its audience and dignifies them with a proper explanation of what went on." To which I still laugh at, cause if they did, it would've been told from the British perspective, just like when they did their special in Burma, and if they they did that, Carlos would've whined about that. Anyway... that entire incident, which could've been avoided if Carlos acted like a legit journalist... but history is what it is, and this put heat on Clarkson following some other over exaggerated incidents, with the rising call from the more insane of folks for the BBC to fire him... which they did when he had a fit of rage that got the best of him. And now... a year later, we have a newly casted Top Gear premiering on May 8.... which no one seems to give a damn about, probably because of Chris Evans (not Captain America... but the guy who used to play 'Billie's Piper') but fans are eagerly waiting for Clarkson along with Hammond and May to return via Amazon Prime later this year. I might just bite the bullet and sign up for Amazon Prime.... well for that and Doctor Who, and other things they have exclusive. Excited for Camden Comic Con!